Hi! I'm Dixie! I'm new to Summit Dog Rescue and my awesome foster mom is learning more about me every day! I'm a Lab mix born around 11-1-2010, so I'm around 8 years old now and I'm the perfect size at 40 lbs. I'm housetrained, and I'm a perfect snuggle buddy! My dream job would be your junior assistant, as I love to go with you in the car and on hikes. I'd also be a great snack tester, by the way, as I love dog treats (hint, hint...)! "We welcomed our newest girl to Colorado this weekend! Dixie flew all the way from Arkansas to find her new home. 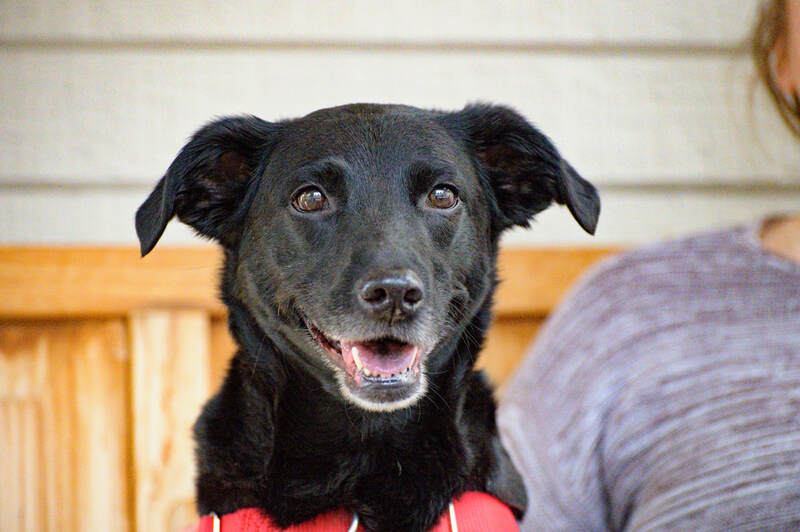 Smiling Dixie is a jewel, and we can’t wait to find her forever family! This lovely lady is always ready for a walk and has perfected snuggle time! She is trustworthy in the house and enjoys sunbathing on the porch and scratches from her people! Dixie is eight years young, 40 lbs, spayed, up to date on shots and microchipped. We don’t know where she inherited her little nub tail— maybe her mix includes Aussie or Heeler? She hasn’t told us yet! She has lived with dogs of all sizes, kids and kitties, too. She would be happy with a family who can spend time with her walking and enjoying Colorado!"